Hot dog and chips inspired by American Girl and intended for doll play. 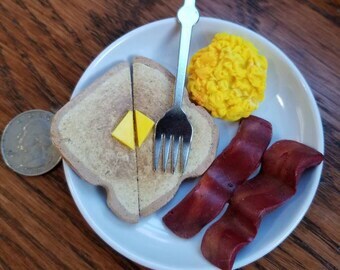 Scrambled eggs, 2 strips of bacon, buttered toast, on plate and with a fork inspired by American Girl and intended for doll play. 2 Slices of Pepperoni pizza on a plate inspired by American Girl and intended for doll 18" play. Halloween Trick or Treat for a Halloween party. A pumpkin bucket filled with goodies Inspired by American Girl & intended for AG doll play. Cracker, Salami, and Cheese tray. Inspired by American Girl and intended for doll play. AG, 18" doll fun. Pitcher of ice cold lemonade & 2 Kool Aid cups also full of ice cold lemonade. Inspired by American Girl and intended for AG doll play. Pizza To Go. 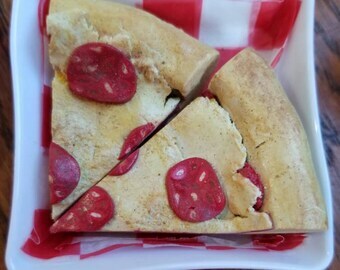 This yummy deep dish pepperoni pizza comes served hot & ready with 2 slices already cut, pepper shaker, and sturdy to go box. Valentine heart shapped box filled with 4 delicious Chocolate Candies. Inspired by American Girl & intended for doll play. AG doll. Starbucks inspired small coffee and croissant on tray. Inspired by American Girl and intended for 15" - 18"doll play. Cutest and most realistic doll food and drinks hands down! A friend gave me her card from a craft fair, and the seller was amazing and very responsive. She even included a set of peppermint bark, candy cane and peppermint shake on a silver tray as a Christmas gift. Any little one would be thrilled with this! So cute and fun! Mom and Me Minis, inspired by my children. My store is inspired by my children. When they were young, we spent many hours creating and playing with doll food made to scale.